Well, it’s been a bit since I’ve made a post here, but with classes starting up and all I’ve been kind of busy. 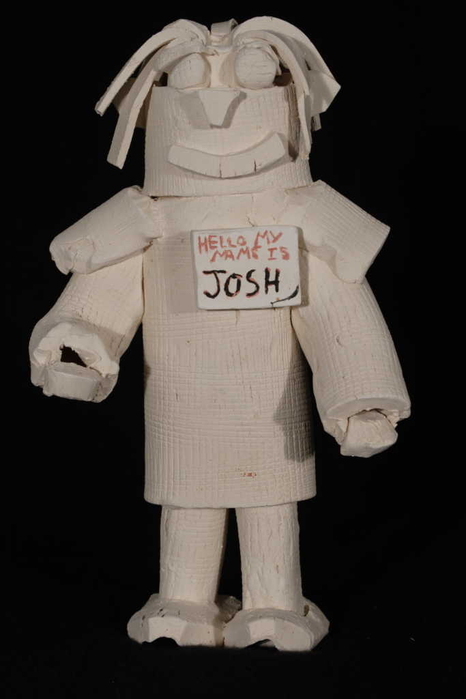 I have had some good times working in the sculpture studio – one of which I created Josh. Before I get ahead of my self though I should follow up on some of the unfinished things from my previous posts. I decided not to go for the welding class this semester – I’ll pick that up next time around. I’m still definitely going to take it, but I’ve got enough to deal with between wanting to do well in my photo class, and having John Pitman Webber as my professor intermediate printmaking. I ended up with 4 classes this semester: Portrait Photography at College of Dupage, Survey History of Early Western Art, Intermediate Printmaking, and World Literature in English. The semester is shaping up to be fun, between photo class, my lab-aid job with photography at Elmhurst College, Printmaking, and the gen-ed class I’ll be plenty busy. Speaking of Jobs I’ve been working a lot with the Art Department helping to hang and take down Art shows from visiting artists. For Instance Ian Weaver was showing for Black History Month. I showed up to help him un-load his van into the printmaking studio for a few days till he could come back and hang the art. I, and a few others, helped to hang his art then afterwards put up posters for it around campus. Next I helped John Webber unload his art for his Sabbatical Art show into the Art Accelerator space – an old ‘atom smasher’ converted into art space. I’ll post a little description of this cool space next time. Tomorrow I’m going to help Ian take down his work and store it in a closet till next week when he can come back with a van to get it. Tuesday I’m going to help Sandy Perlow hang her work. At least I’m getting paid nicely. I’ll also be ‘art sitting’ on Saturday from noon till 4pm for about a month – making sure no one steels John’s art. I took an Art history class before with Richard Pulsen, who is one of the worst history professor’s I’ve ever met. He’s a nice enough guy in person, but as a history profess he’s dull and teaches a pointless class that is all memorization with your entire grade resting on the cumulative final. I failed the course and with that said I recommend you stay clear of him at all costs. As I mentioned above I’m taking an other art history course this semester, but this one is actually fun! Phyllis J. Kozlowski is the professor, and she is a truly great professor! Phyllis is actually interested in teaching and wants her students to share in her joy of the subject. She has tests throughout the semester, and no cumulative final. It’s great and I’m actually enjoying the class. I fully intend on taking my remain two Art History classes with her. Rock on Phyllis! So yeah, Josh, Smokey, Samantha, and the gang. What fun! I really like Josh, he’s my favorite so far. I’ve been working on re-conceptualizing these figures. I really like the base idea, but I feel they still need some work, there’s a few issues that need resolving. The most recent figures I did were supposed to be apart of a fountain, which is what inspired the pot-heads and long tongues. I don’t think it really needs that, it was an off-shoot idea that basically failed. Basically what I’m working on here is just making several small figures to see what works, what I like. From that I will hopefully be able to come up with some good ideas to take into my capstone design. What do you think? Do you like josh, and /or do you have any suggestions?